From the front of the choir: Music notation – do singers need it? Music notation – do singers need it? I teach songs without using any kind of musical notation. Like other members of the Natural Voice Practitioners’ Network I believe that singing should be accessible to all. You can learn songs by ear without ever having to know anything about music theory, notation, composition, harmonic structure, musical jargon, etc. But notation obviously has a role in singing. I’d like to look at what that role might be, and why many people are intimidated by musical knowledge (see Mind your language). 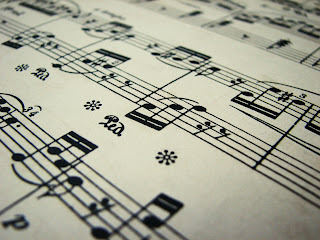 music notation — what is it? It goes on to say that the earliest know examples of notation date back to Sumeria more than 4,000 years ago. Why do we need musical notation? One main reason is as an aid to memory (since I have a huge repertoire of songs to teach, and I have to know all the parts, I often find myself using sheet music when I’m teaching in case I forget how one of the harmonies goes!). It also allows us to preserve music over long periods of time. Our memories may be fallible, but the written score doesn’t change. However, notation is not an exact science. As many composers have discovered, even though they try to describe their music as accurately as possible, it is always open to interpretation. Otherwise there would only ever be one perfect, canonical performance or recording of any piece of music! When trying to notate an existing piece of music, there will always be errors. The annotator may not hear correctly; they may refuse to acknowledge unfamiliar harmonies or rhythms (many folk song collectors edited songs that they found because it didn’t fit in with their perception of how the music should sound! ); the singers performing may make a mistake (which will be faithfully recorded). One of the biggest problems when trying to notate living music is that – even if we could notate it perfectly – it would only represent one particular performance at one specific time. If you came back and listened the next day, the song might sound different. There are many apocryphal tales of people hearing wonderful South African singing during a church service and notating it. But when they came back the next week, they discovered that all the harmonies were different! People were making it up as they went along and improvising around well-known structures. So many song collectors come back from their travels with a supposed definitive example of a particular song, whereas if they had collected it at a different time, or if they had travelled to the next village, they would have heard a different version. We are trying in vain to capture a living thing. Bearing this in mind, we shouldn’t get too upset when, in rehearsal, there may be more than one harmony going on in the alto section for example! Singing should be fun, creative and alive. But often we hear people say: “that’s not how it’s supposed to sound!” The danger here is that musical notation can often take on the role of dictator. It can imply that there is only one way – and certainly only one ‘right’ way – to sing a song. However, throughout history songs have changed over time. The folk tradition is a living tradition. People have adapted words to fit their times, have changed (or stolen) tunes to suit them, have added new harmonies, have misheard or mis-remembered lyrics and melodies, have performed a song in the style of their own community. That is what makes music a living force. Having a written score can represent an academic and tyrannical view which may well intimidate those new to music-making. Many people claim not to understand musical notation. They wouldn’t know what to do if presented with a musical score. Yet quietly in choir they are inventing a whole new notation system! This especially applies to the basses who may often not have a particularly memorable or melodic part in a song. They find it hard to remember where the pitches go up and down so they begin to draw horizontal lines on a piece of paper to indicate this. The higher the line relative to the rest of the line, the higher the note. If they need to indicate a large pitch change, then the line will have a big gap from the previous line. If the pitch only changes very little (by a semitone for example, or by a note that is not in the scale of the song) then they may add a mark like a dot or small arrow to indicate this. To show when the pitch changes, they make the length of the lines connect with how long the notes are to be sung. You can see examples of this in Northern Harmony’s song books where they notate some Corsican songs using this method (see Complex songs and learning by ear). When you point out to the basses that they are, in fact, both reading and writing music, they usually strenuously deny it! Most teachers know that individuals have very different learning styles. They are usually divided into visual, auditory and tactile/ kinaesthetic. I am a very visual learner, and although I can learn songs by ear quite easily, I usually have to have at least one quick glance at the lyrics in order to be able to remember them more easily. I also like the song teacher to use their hands or some kind of diagram to indicate how the melody line works. Auditory learners are perhaps the most suited to learning songs by ear. Most visual learners will need to see something, although not necessarily written notation. Most people respond well to the teacher indicating by hand where the melody goes up and down using, for example, a very simplified version of the Curwen Hand Signs developed by Kodály. Tactile/ kinaesthetic learners learn by moving, doing and touching. Such learners often find it easier to mirror the hand movements of the person teaching the song. They also find it much easier when taking the song’s rhythm into their body. Some visual learners will prefer to have a written score. But many who insist on having written music, may actually be aural or tactile learners. They are just so used to having music that they need it as a security blanket! This also appeals to those people who don’t like making mistakes and believe that the written score will help them to get it perfectly right (forgetting that the notation itself is error-prone!). Sometimes, taking the music away can free people up and introduce them to a new way of learning. Learning songs by ear is like exercising a muscle. Once you’ve done it for a while, it just gets easier. Many people who insist on written music are reluctant to spend time in that fuzzy, uncomfortable place where we don’t know exactly what we’re doing and we haven’t fully grasped the song yet. Being able to sight read gives immediate access to a vast range of songs from a huge range of cultures and time. If we want to have a good old sing song with a bunch of strangers, then just get the songbooks out and we’re off! But a couple of hours later, with no songbook available, we just have the memory of the good time we have. It’s very unlikely that we’ll remember any of the songs themselves. If we learn a song by ear it will take us much longer, but it also gives us the chance to explore it in detail, discover all the subtle nuances within it, really listen to the harmonies, enjoy playing around with the words. Songs learnt like this will stay with us and become part of us. Once we have truly learnt a song like this we can start making it our own and putting something of ourselves into the singing of it. We will have made a much deeper connection with the music. it looks better in performance – the audience will be able to see the singers! I’m really interested in how complex a song can be and still be taught by ear. I’ve written a previous post about it: Complex songs and learning by ear, but am still not sure. I’ve tried using diagrams to help with the overall structure of a song. This helps some people, but not all!